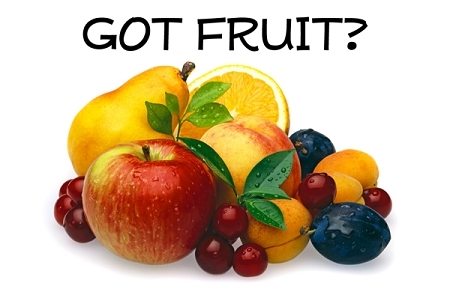 Fellow Christian, Do YOU "Got Fruit"? How many professing Christians do you come across on a weekly basis? How many of those professing Christians have fallen for the great scheme of American "Ear Tickling" Christianity, or Calvinism - sadly, the answer is MANY. "Got Fruit" tracts are straight and to the point. 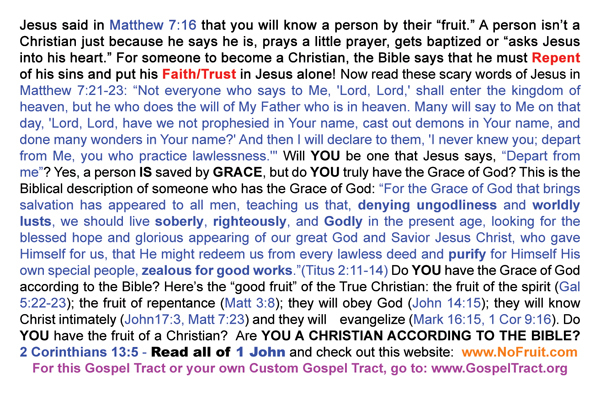 As soon as someone says to me "I am a Christian", they get a "Got Fruit" tract. Some people are thankful and others are highly offended; if they are offended then that means it's working! I recommend that these are kept on hand at all times; especially when everyone you come across, seems to be a "Christian". They are great quality, very durable, printed very nicely, and all at an amazingly low cost! I especially love handing these tracts out around church events and other church gatherings, for many are lukewarm, and these warnings are Scriptural and causes the reader to truly repent- getting them ready for the work of the Kingdom! 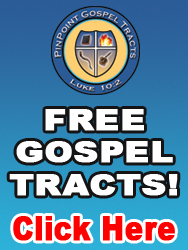 This tract is great for encouraging professing believers to examine their walk in a biblical and loving way. Definitely recommend. A good reality check for all of the church goers and so called Christians that we meet. This is a great Gospel Tract. You run into so many "believers" who are lost. This tract really lets them examine themselves to see if they are in the faith.